Two Great Tools For One Low Price. Picture Hanging Made Easy! 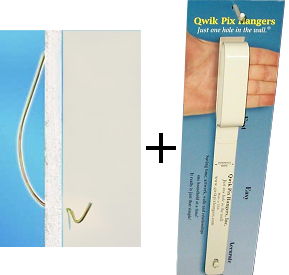 A great combo pack for anyone that wants to make hanging pictures fast and easy. When you buy the Qwik Pix Hanger and He-Man hooks together, you save several dollars when compared to ordering them separately. These two great tools will make it easier than ever to hang pictures in your home or office. The combination of the two will allow you to place your pictures exactly where you want them and hang them quickly and securely with no additional tools. You won't have to find a stud for a secure hold with the He-Man Hooks, and determining the right place to put the hook is made simple with the Qwik Pix Hanger. Easily hang pictures in a certain arrangement or even in a perfectly straight line. No hammers, laser levels or nails necessary. Get the Picture Hanging Combo and you will be able to hang things like a pro. Spend less time and get better results with good stuff from us. These tools are so simple, and that is what makes them so great. They are practically fool proof, and will allow just about anyone to hang pictures like a pro. Use them for clocks, artwork, mirrors, photos and more. If you can hang it on a hook, you can position it perfectly with a Qwik Pix hanger and hang it with a sturdy He-Man Hook. This combo is ideal for anyone that wants to make hanging pictures on the wall easy. With these tools handy, you will never put off hanging things again. It will be too easy and fast to have any excuses. Just try it for yourself. Just pick a point on the wall where you want the bottom of the hook to sit. Then, measure 1/4" directly above that point and set the tip there. Next, with firm forward pressure, twist the hook back and forth (like a key) until you have chiseled through the wall. Now turn the Hercules Hook upward and push completely into the wall until only the hook is exposed. That's all there is to it. Just hang your item as usual. These hooks are so easy that anyone can use them. First you hang your picture or other item on the hook located at the bottom of the Qwik Pix. Then hold it against the wall and position it so it is hanging where you want it to stay. Next, make a small mark, with a pencil next to the reference mark on the Qwik Pix. Remove the picture from the hook and then re-align the Qwik Pix with the mark you made on the wall. Now all you have to do is place a small mark in the hole under the hook. This is exactly where you need to put your nail, so just pound one in and hang your picture. It is just that easy to hang a picture in the exact location you want it. Get perfect placement each and every time! Order Yours Today! Qwik Pix Dimensions 1" x 13"
Hook Dimensions 4.5" x 3"
Hook Max Weight 150 lbs. Picture Hanging Combo - The easy way to hang a picture. The Qwik Pix is the best way to make sure you hang your pictures exactly where you want them. He-Man Hooks allow you to hang pictures without tools or finding a stud. Order Yours Today! Fire And Water Blend Together To Create a Captivating Scene.